Hooks, Latches, Locks There are 16 products. This Wrought iron lockable Door Latch from hand forged steel using traditional blacksmithing techniques. Forged in the workshop of Ahti Tedremäe Artist Blacksmith (www.thorman.ee). Bees waxed and oiled to prevent it from rusting. 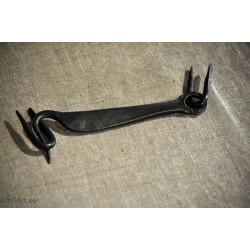 This Wrought iron Door Hook from hand forged steel using traditional blacksmithing techniques. Forged in the workshop of Ahti Tedremäe Artist Blacksmith (www.thorman.ee). Bees waxed and oiled to prevent it from rusting. 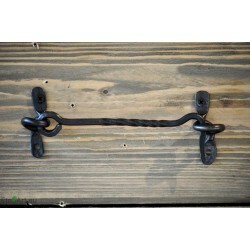 This Wrought iron lockable Door Hook from hand forged steel using traditional blacksmithing techniques. Forged in the workshop of Ahti Tedremäe Artist Blacksmith (www.thorman.ee). Bees waxed and oiled to prevent it from rusting.